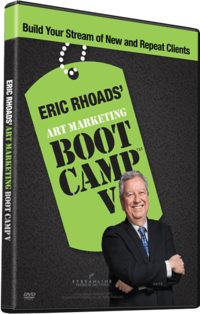 If you're an artist blessed with a marketing gene, you may already know these secrets. Yet as I communicate with over 40,000 artists in my art marketing blog, I find that most have never heard them. I'm not talking about positive-thinking hocus-pocus. But when I interview successful people, they all have one thing in common: "I made up my mind that I'm not going to let this recession impact me." This is a CRITICAL step. Most of us give ourselves an out by telling ourselves that it's OK to fail because everyone else is. To succeed, you cannot think like everyone else. I have a giant sign in my office that reads: "2010 Is Our Best Year Yet." Note the use of the word IS -- not will be. It's important to train your subconscious mind to believe that it is. I have to look at it daily and not let myself off the hook. You wouldn't take a road trip without a map, yet most artists don't have a road map for their art business. Most don't like to look at themselves as businesses, but as artists. But if you rely on income from your art sales, you are in business. A critical element is to create a business plan. Put it in writing and mark the milestones on a calendar. Hold yourself accountable and look ahead. If you're about to miss a milestone, don't let yourself off the hook. Develop a list of tactics and build them into your plan. How can you make money while you sleep? The key is to find ways your art can sell without your having to manage the process. You're just one person. How can you get several people viewing it and selling your art? The more sales agents selling your work, the better. Galleries, for example, are sales agents. Where is money already flowing? Go there! If one city is selling a lot of art and another is not, target a gallery or a means of selling in the city where sales are taking place. A big New York City gallery opened a location in Beijing during the Olympics because of the influx of money there, and because so many Chinese were buying art. Art is selling well in some places. Find out where, and find a way to get your art there. I never recommend lowering prices because it's hard to raise them again. But many artists know that when money is tight, it's easier to sell a less expensive painting. Many artists are creating smaller works. One artist I know is creating one small painting a day and selling the paintings on eBay (under an assumed name) for $100 each. He sells almost every one, and is generating an extra $2,000 a month. He is also painting fewer large works, but his galleries are moving the small ones. Seek every opportunity to increase your visibility as an artist. It increases the odds of getting noticed. Bottom line: More bait in the water equals more fish on the hook. Work hard to generate publicity from local, regional, and national publications and websites. Take an active role on Facebook and Twitter. Post new works that have not been seen before. Send e-mails and new-painting notifications to collectors, and expand your build. Place ads in publications. You need to be seen MORE when times are worse because you need to reach more potential buyers. I've been a marketing guy for many years, and the most critical marketing lesson is that ONE impression does not sell. People may see your ad or story, but they won't remember it. They may intend to respond, but they forget. That's why you see the same ads over and over on television. Repetition works. Single impressions do not. Repeat your message over and over. Do you consider yourself local, national, or international? If you only sell in your town or region, you're limiting yourself to local cycles. If you can get into more cities and art centers nationwide and worldwide, the increased exposure will lead to more sales. Get some friends together and brainstorm. Make a list of 100 ways you can sell paintings. You say there aren't 100 ways, but there are. Force yourself not to stop until you get to 100. Don't judge anything. Write every idea down, then start trying some you've never done. Creative approaches will make you stand out. Every product is a brand. You, the artist, need to be a brand. When people know brands and know what that brand stands for, over time they develop trust. Trust often equals a purchase. You trust McDonald's for consistent food anywhere in the world. Though this goes along with visibility, find ways to reinforce the things you think people need to know or remember about your artwork. "Jill's paintings are...." or "Bob's photographs are...." Advertising and publicity can build your brand, but it's best if you control the way the brand is perceived. You can also do branding with Facebook, Twitter, blogs, etc. Be careful to build the brand in a positive way. For instance, if every Facebook entry shows you with a bottle of absinthe in your hand, it may send the wrong signal (or the right one, if you feel the bad-boy, Van Gogh approach is your image). Start with what you want your image to be, and find ways to reinforce that focus. It's true. Fewer artworks are selling. Yet every day I hear reports of artwork sold at all price levels. Guess who is selling the artwork that is being purchased? The artists who are working to remain visible. Most artists shrink back during tough times, when they should be working harder to be seen. Yes, it takes guts. Yes, it's hard work. Yes, there is risk. But consider the alternatives. The rewards are worth it. Make up your mind to make a plan, stick with it, and be accountable to it. Join 40,000 artists who are reading my art marketing blog. Please sign up today. PS: My friend Charlie met his financial goals for 2009 because he made up his mind to succeed and he made a plan. He doubled the number of galleries he is in with his ad in Artist Advocate, a magazine I publish that connects artists to 6,500 galleries. We would be honored to help you land more galleries. Watch this two-minute video. PPS: The next issue of Artist Advocate deadlines November 11. The people listed below can help you find out if this is right for you. Ads are often written under the assumption that we can get people to care about things they don’t really care about. But this approach rarely succeeds. 3. Use creativity in delivering your message. 1. What you say matters most of all. Speak to a felt need. Good advertising isn’t about the product or the company that sells it. Good ads explain how the customer’s life will be different. 3. Deliver your message using whatever media offers the best psychological environment. In what moments would a candidate for cosmetic dentistry be most open to the message we crafted about being treated differently? Advertising works best when it speaks to what customers already care about. This is called “speaking to a felt need.” I've never met anyone that's had a secret, unmet desire to go to the dentist. But tens of millions of us secretly wish we were more attractive, more confident, and that people treated us differently. Capiche? Good ads aren’t about the company that’s paying for the ad. Good ads are about the reader, the listener, the viewer of the ad. This is especially true when writing classified ads for employment. A man attending a class at Wizard Academy confessed that, working part time, he had made more than $850,000 in employee placement fees as the direct result of a single chapter he had read in my second book. I congratulated him on having had the perception to recognize the potential in that chapter. Last week I received an email about that same chapter in my second book from William, an Acadgrad living in St. Petersburg, Russia. I received an email from my business partner (Thatcher) earlier today, telling me that we had found the perfect applicant for an opening we have in our company. I crafted the job ad based on one of your chapters in the second Wizard of Ads book. This is what I replied to him: "She's perfect. The Wizard of Ads is a genius, and this girl is just what we want, don't you think? I mention the Wizard because I used an article of his on writing job ads for that one. He said the person we were looking for would recognise themselves in the ad, and we wouldn't be swamped with tedious junky mass-applications. And indeed that's what happened." So thank you, Roy, for all your amazing free advice; I have yet to meet this girl, but judging by the application, I think she should fit in well. That chapter, by the way, is called "Writing Classified Ads for Employment." It's chapter 76 in a 101-chapter book called Secret Formulas of the Wizard of Ads, a New York Times and Wall Street Journal bestseller. Here's an example of the strange type of classified ad that always gets superior results. William, I'm glad you found the perfect employee. I look forward to your next visit to Austin.